Truly a one of a kind. 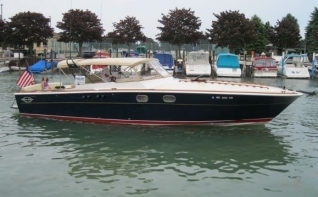 Boat house kept year round, this classic Magnum 38 Sport underwent an extensive refit by the famed Mayea Boat Works in 1998/1999. In addition to interior updates, the cockpit was reconfigured to a center console; she was repowered with a pair of CAT 3208’s and custom teak throughout. Add in the Flag Blue hull and she will draw a crowd.